Compatible with New iPad 9.7 2017/2018, iPad Pro 9.7, Air 2, Air. Magnetically folds into a portfolio case protecting your New iPad 9.7 2017/2018, iPad Pro 9.7, Air 2, Air. Easily setup your iPad the first time; pairing is automatic once the keyboard is turned on. Rechargeable keyboard for long periods of use and convenience. Comfortable and natural feel keys for quick response typing. Bluetooth keyboard can used with other Bluetooth enabled devices including iPhone. Stylish Vegan Leather Protective Case. Special keys for Brightness, Volume, Home, Screen Lock, and Playback. Turn your iPad into a super portable laptop! Working Time: 150 hours, Standby - 100 days, A Single Charging - 2-3 hours. 3 IN 1: Backlit Wireless Keyboard + Multi-angle Stand + Premium Carrying Case, for New iPad 9.7 2017/2018, iPad Pro 9.7, Air 2, Air, it is extremely convenient to take your tablet to office and travel. 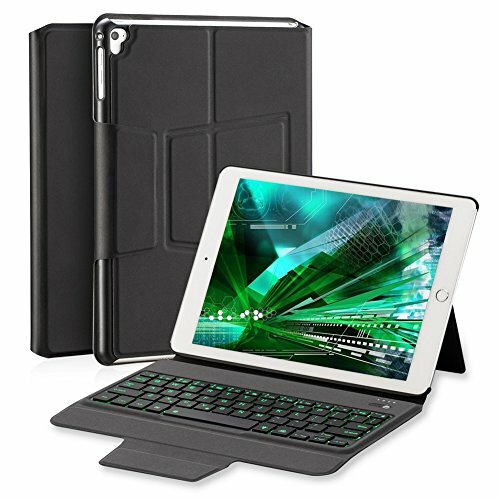 TYPE & PROTECT: Designed for New Tablet and provides full-body protection with this smart folio keyboard case. HANDHELD & HANDSFREE MODES: Tablet 9.7 snaps to magnetic upright angle for typing and media viewing or lies flat over the keys for handheld use. QUICK ACCESS KEYS: Built-In multimedia and quick-access hotkeys, provide one-touch access to your content. ULTRA-LONG BATTERY LIFE: Rechargeable lithium battery gives keyboard up to 150 hours of continue usage on a single charge (2-3 hours Charging). Power-saving triggered after 15 minutes idle. If you have any questions about this product by Apsung, contact us by completing and submitting the form below. If you are looking for a specif part number, please include it with your message.